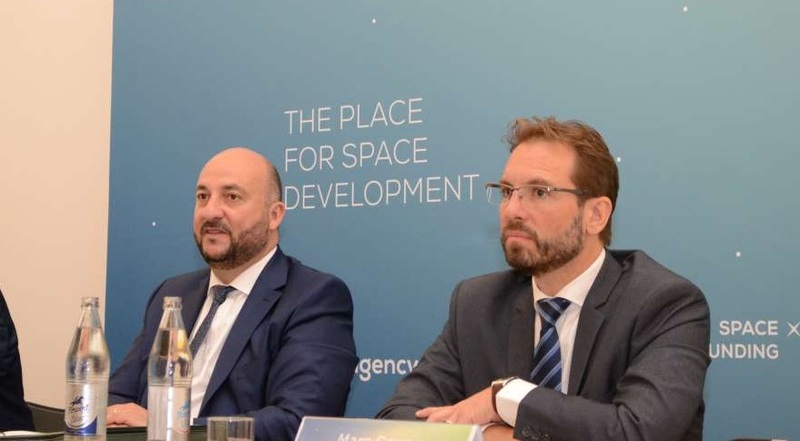 Étienne Schneider, deputy prime minister of Luxembourg, and Marc Serres, CEO of the new Luxembourg Space Agency, discuss the agency's plans at a Sept. 12 event. Credit: Luxembourg Ministry of the Economy. PARIS — The government of Luxembourg continued work to expand its role in the global space economy Sept. 12 by formally establishing a national space agency, a move designed in part to ensure the effort continues after an upcoming election. The Luxembourg Space Agency will have about 12 people on its staff initially, according to Schneider, with more likely to be added in the future. The agency’s offices will be within those of the Ministry of the Economy, although he said he expected the agency to later move into its own facility. Among the companies that established operations in Luxembourg is iSpace, a Japanese company developing lunar landers. The company has about 15 employees in Luxembourg, said Kyle Acierno, iSpace’s managing director for Europe, in a recent interview. Those employees are split roughly evenly between engineering and business development. Another benefit of the agency, he said, is to help ensure that the ongoing space initiatives survive the current government. Luxembourg is holding parliamentary elections Oct. 14 with no guarantee that Schneider will remain in office. “The activities right now, especially in regards to the space resources initiative, are the vision of Étienne Schneider,” Acierno said. Creating a space agency could provide long-term sustainability for those efforts independent of who is in government.